The wildly popular CheerUPDATES Twitter feed started off simply enough. DJ Yeager, then a coach for the now-shuttered Galaxy program, was traveling to the Majors in 2012, and his athletes wanted play-by-play updates from the competition. Word spread quickly, and by the end of that first evening, CheerUPDATES accumulated 500 followers. Athletes at gyms around the nation and in Canada, it seemed, were desperate to know about stunts, omissions, pyramid hits, standing fulls and dismounts. Yeager, 29, kept Tweeting and the followers kept reading and re-Tweeting. By the time Worlds rolled around, much to Yeager’s surprise, CheerUPDATES had amassed 11,000 followers who devoured each 140-character Tweet packed with information—in widely understood cheer shorthand—about each team’s performance. The most popular Tweets, of course, included just one word that said it all: HIT. “Twitter is so immediate and it lends perfectly to the cheer competitions because of the coded system of deduction,” says Yeager. From the get go, Yeager made sure the CheerUPDATES posts were precise, accurate and, most importantly, unbiased. “I stuck to the facts,” says Yeager, whose deep knowledge of cheerleading began back when his sister first began competing. He’s also coached and consulted with teams about everything from music to stunts. After Worlds, Yeager began attending competitions when he could, and Tweeting the results live. Followers would re-Tweet and reply, share photos and comment. All the while, however, the account was shrouded in mystery as the man behind the Tweets was as yet unidentified. There were rumors, but Yeager kept his alter ego secret and didn’t emerge as the CheerUPDATES mastermind for some time. By the middle of 2012, Yeager’s cover was mostly blown. “They figured it out,” said Yeager. Nothing changed, however, and today CheerUPDATES boasts more than 150,000 followers who, during competition weekends, will hang on every tweet that Yeager or his co-tweeter, Marley Lopez, fire off at a feverish pace—about every 2.5 minutes. Even if there aren’t competitions, the Tweets are energetic and frantic, peppered with contest announcements, giveaways, emojis and cheer-related chatter. The industry has also taken notice of Yeager’s enthusiastic and very targeted social media following, and resulting content sharing and marketing opportunities have enabled Yeager to monetize his efforts. “It took a season and a half to start making any money but it was worth it,” says Yeager, who, should he have to miss a competition, calls only on a few very trusted sources to run the show. But for the most part, he or Lopez will travel to as many competitions as time allows and park themselves with their gear, a computer and an iPhone in front of the stage until the lights dim and the music cranks up. During big competition weekends, “it’s insane,” said Yeager. Hundreds of new followers—and hundreds of thousands of re-Tweets and interactions—are the norm. That’s because besides CheerUPDATES, there’s also CheerUPDATES2 (a Twitter feed aimed at the younger, Level 1 cheer crowd) and CheerMEDIA. 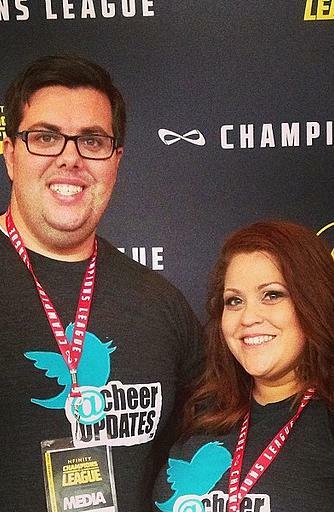 Their latest endeavor, CheerMEDIA launched in 2014 and serves as a stationary source of video, music and other multimedia that so often get buried in the frenetic CheerUPDATES Twitter feed. “People can seek it out,” said Yeager. The cheer-obsessed social media doesn’t end there. CheerMedia is on Instagram, too, and averages 45,000-70,000 likes on a given weekend. He’s already evolved. Yeager sent the first CheerUPDATES Tweets using a Blackberry device; today, Yeager is a one-thumbed master of the iPhone 6. Given the time commitment CheerUPDATES demands, Yeager rarely puts his phone down. When he does, it’s to coach at TriState Athletics in Delaware, go walking or shop. But for the most part, he’s happily connected all the time.